The Trump administration is looking to clarify the rules which govern whether a person can discharge student loans in bankruptcy, according to a public notice issued by the Department of Education. The agency is seeking input in order to determine "whether there is any need to modify" how bankruptcy claims are evaluated. Under current law, student loans cannot be discharged unless a borrower has filed for bankruptcy and can prove an "undue hardship" which prevents repayment. Circumstances which constitute undue hardship have never been defined by congress, leaving it to bankruptcy judges to decide on a case by case basis - typically setting extremely the bar extremely high. As a result, very few borrowers are allowed to expunge their debt. The U.S. Department of Education (Department) seeks to ensure that the congressional mandate to except student loans from bankruptcy discharge except in cases of undue hardship is appropriately implemented while also ensuring that borrowers for whom repayment of their student loans would be an undue hardship are not inadvertently discouraged from filing an adversary proceeding in their bankruptcy case. Accordingly, the Department is requesting public comment on factors to be considered in evaluating undue hardship claims asserted by student loan borrowers in adversary proceedings filed in bankruptcy cases, the weight to be given to such factors, whether the existence of two tests for evaluation of undue hardship claims results in inequities among borrowers seeking undue hardship discharge, and how all of these, and potentially additional, considerations should weigh into whether an undue hardship claim should be conceded by the loan holder. 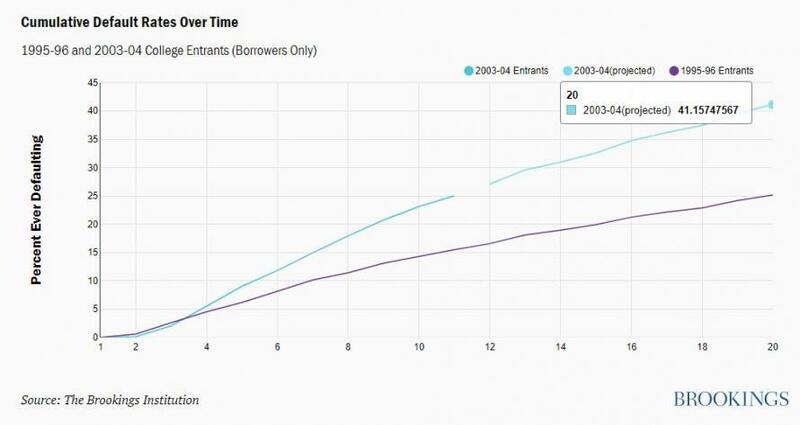 Considering that nearly 40% of student loan borrowers from the mid 2000's may default by 2023 according to Brookings, it's clear something is going to need to be done, especially since the alternative is a wholesale taxpayer bailout. Meanwhile, Brookings released another study on Friday revealing that most borrowers who left school owing at least $50,000 in student loans in 2010 had failed to pay down any of their debt four years later. For those with floating rate loans, the pool of those "drowning in debt" will only get worse as the Fed continues to hike. 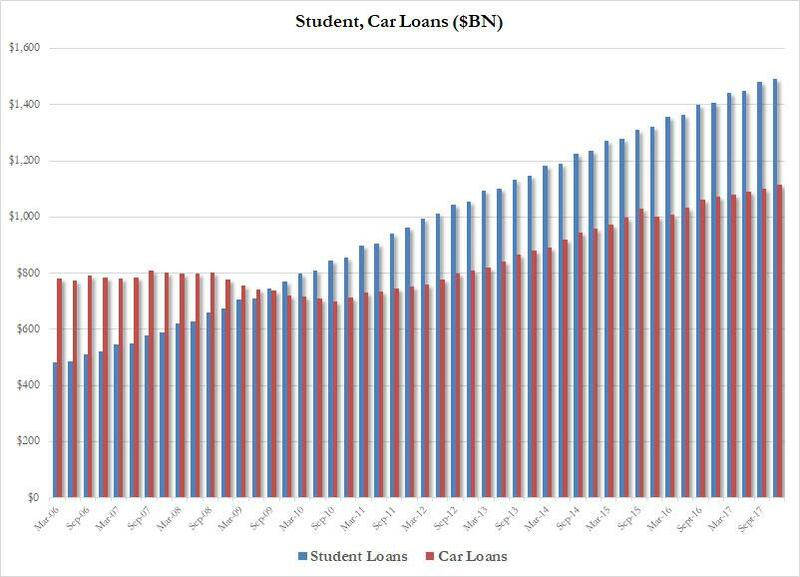 And as we showed earlier this month, auto loans and student loans just hit a new all time high to close 2017. 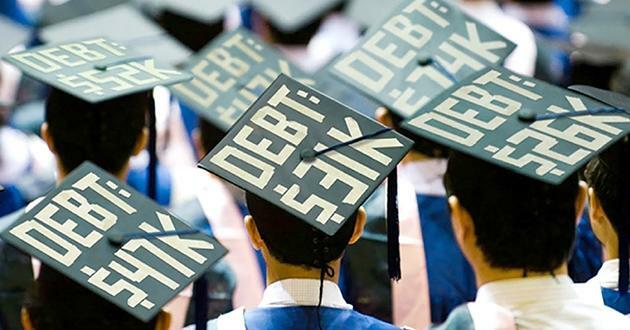 Roughly $1.38 Trillion in outstanding student loan debt is owned by over 40 million Americans - most of it secured from the federal government, according to the NY Federal Reserve. 11% of it is over 90-days delinquent, while over half of student loan debt is held by borrowers who don't have to pay because they're still students, unemployed, or for other reasons. According to the Wall Street Journal, "Strike out those instances and the share of delinquent student debt is more like 22%" based on federal figures. A Wall Street Journal analysis found that fewer than 500 people attempted to extinguish student debt last year, when roughly 766,000 individuals and couples filed for bankruptcy. The number of cancellation attempts has fallen by 45% since 2010 as fewer people filed for bankruptcy and as repayment programs for federal student loans grew in popularity. 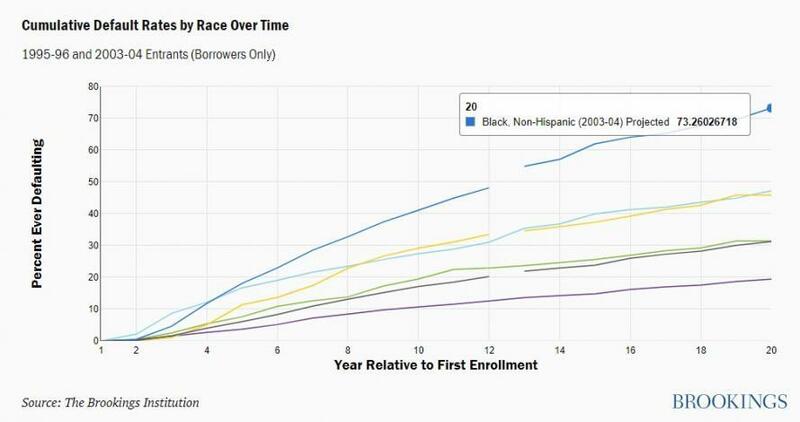 Meanwhile, more and more borrowers are taking on far bigger debt-loads than in prior years - since those pizza parlor jobs don't exactly pay for college anymore - and as the auto loan chart above shows, kids these days aren't really into taking public transportation. We wonder if newly minted Fed Chairman Jerome Powell has been reading the owner's manual on that shiny helicopter Ben Bernanke loved so much. After all, it's got that cool new "corporate bonds" and "equities" add-on package that's sure to maintain market order in even the roughest conditions.